Was able to go faster with this round, and I think if the rings are smaller I don't have to take the time the let the shuttle untwist before closing the ring and that is very time consuming. I stuck to 4 double stitches but when all was said and done I had to do what Jane Mactats did and add even more to the long connecting parts on my size 40 thread with 6 chain ds. when 4 or 5 should have worked. Do you think there are 2 hands at work on Renulek's doily which is causing tension issues? As in the antique books? In fact I noticed this even in some of Blomqvist & Persson's patterns. I love your color choice! I started round 9 this morning, so it will be a while before I catch up. Love your colour choice, it's going to be a beautiful doily when finished. 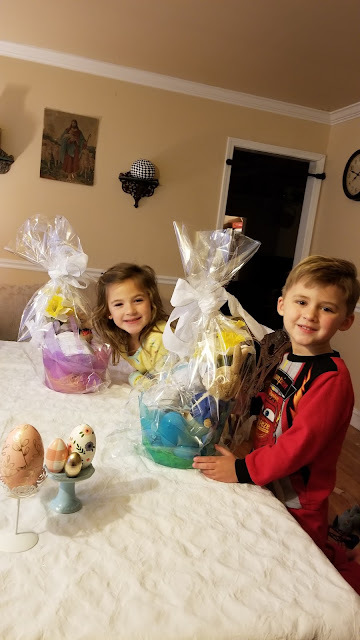 The children look happy with their Easter baskets I take it you made them. Yes, and I loved your card we have tried to collect Peter Rabbit things though out the years such fun and sweet writings too! Beautiful spring colors in your doily. The yellow is so sunny and warm! I think tatting with such bright colours can make you happy, it sure works for me. Happy Easter! Yes I was thinking it was a perfect color for this weekend it does make me feel good! Estou cada dia mais encantada,com seu trabalhinho. Você está indo rápido ,esse colorido das cores é maravilhoso. Quanto as crianças ,devem ser netos também? Olha só que carinhas felizes , com suas cestas. thank you and I agree with you, life and children are pressious, the eggs on the table in the picture, my daughter bought with the grandchildren and they are nesting eggs like the dolls. one of my favorite things. Wow, the final result is very nice! And the childs are so cute! Looks wonderful! You're ahead of me now, I had some sewing I needed to do. Your doily is looking fabulous the colours are so bright and cheerful. I'm slowly catching up after tension issues! Happy children, you are so fortunate to have little ones around, my only grandchild lives in Singapore.